Washington (AFP) – The vast sums of money funding political campaigns in the race to the White House are “obscene,” George Clooney said Sunday, chiming with Bernie Sanders despite supporting rival Hillary Clinton. “I’ve been a very big fan of hers,” the Hollywood heartthrob said of Clinton, the Democratic presidential frontrunner, in an interview on NBC’s Meet the Press. “But I want to say this: I really like Bernie and I think what he’s saying in this election is important if you’re a Democrat,” Clooney added, just two days before a crucial primary in New York. Clooney was asked about the huge sums raised at dinners with rich donors, like those the actor hosted for Clinton in San Francisco on Friday and at his Los Angeles home Saturday. The back-to-back events were reported to have raised over $15 million, with donors paying as much as $350,000 a head. “Yes, I think it’s an obscene amount of money,” he said. “The Sanders campaign, when they talk about it, is absolutely right. It’s ridiculous that we should have this kind of money in politics, I agree,” Clooney added. Unlike Clinton, who has tapped big donors to fuel her campaign, Sanders has relied on small donations that he says average $27 per person. CNN reported that a Los Angeles neighbor of Clooney’s held a rival fundraiser for Sanders at $27 a head, and handed out dollar bills to be thrown at Clinton’s motorcade as she drove by. 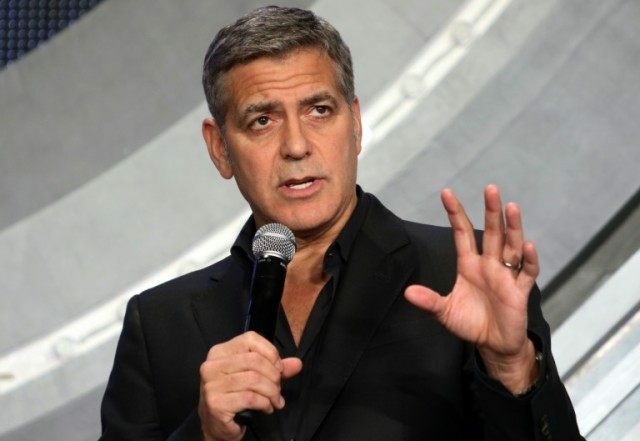 Clooney blamed the fundraising excesses on a Supreme Court decision that opened the floodgates on unlimited corporate and private giving to campaigns. “The Supreme Court can overturn Citizens United (the ruling) and get this obscene, ridiculous amount of money out so I never have to do a fundraiser again,” he said. In the meantime, he argued, funds have to be raised so Democrats can win back control of the Senate.